Out of the water, I head back to the hotel, shower and change. I sit down for breakfast just after 8am. I fill up on eggs and bacon. Even a ham and cheese sandwich on a cheese roll. Back in my room just laying around thinking about what to do, when Marcus and I decide to meet up at 11am for one last ride. 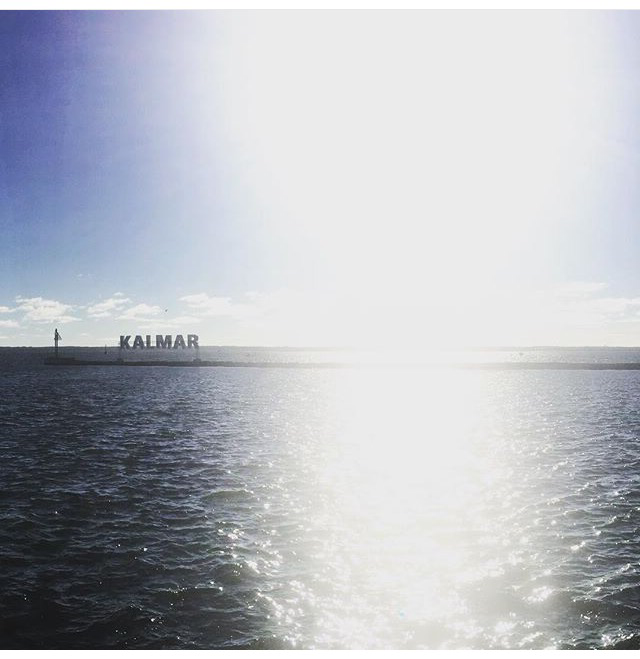 We go out to the turning point on the Kalmar loop and then head back. After another shower and by 13:30 I’m sitting down for lunch with Christopher and Jane. Luckily for me, they had to wait 45min for their food, so we all got served at the same time. After lunch I walk around the city and eventually make it back to my room to pack. Packing went quickly because I had gone through my stuff 2-3 times during the past two days. Just after 4pm I’m racking my bike up in row M on spot 1839 and placing my bike & run bags on the correct hooks in the transition area. My equipment is now ready to race! I hang out in the expo area for a while, checking out all the stores, meeting and talking with friends in the area. I get another 15 min massage on my right upper chest. It really hurt but helped eliminate the numbing in my fingers while biking earlier in the day, so I figured it could not hurt to get another massage. Around this time some of my teammates are deciding on what and where to eat. Pizza at Athena just before 6 pm. By 8 pm I’m back in my room with a Ben & Jerry Half baked and ready to watch “Insurgent”. When the movie was over, I shave and then decide to watch “Fast & Furious 7”. Amazing how many people were on Facebook and Twitter between 8 pm and midnight. With my alarm set for 4 am I turn off my lights and fall asleep. Once I decided to sleep it was no problem. I was out before midnight and did not move until my alarm went off. Alarm goes off, it’s 4am. Throw on a t-shirt and my shoes and go down for breakfast. I join Alexander, Joel, Christopher and Jane. I eat slowly and get in a lot of liquids. Around 4:40 myself and others started to head back to our rooms. The transition area was going to open at 5am. I get to my bike and the only I planned on doing was filling my bottles and checking air pressure in my tires. But my front tire does not spin freely! Crap!!!! Nothing I can do, the rim has twisted. I don’t know if I hit a bumped on Friday, or if it was the heat during the day after I racked my bike. Either way,I remove some air and hope I don’t get a flat out on the course. I go back to my room and rest for about 30 minutes before going to the starting area. By 6:40 I’m standing in the front of the line along with the other swimmers. I’m feeling an amazing calmness. 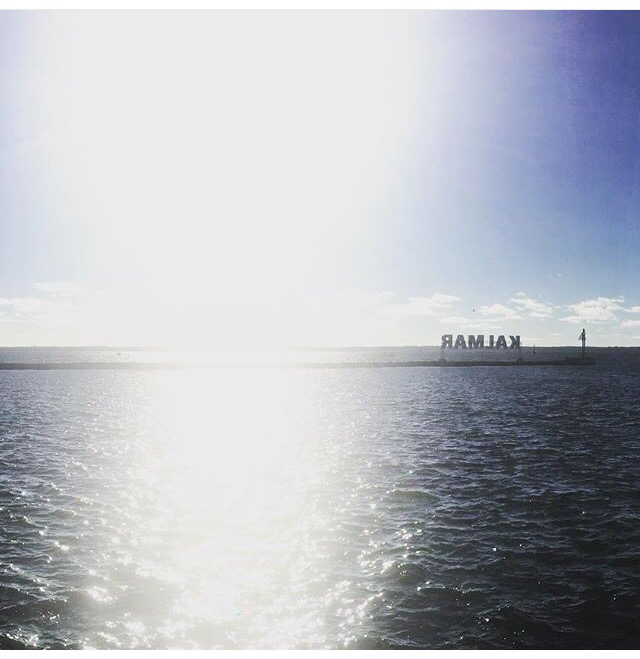 The wind is blowing, the waves are rolling into the harbor,and I know now it’s going to be a hard swimming. I talk a little with Robert and the others. At 6:55 the pros start. 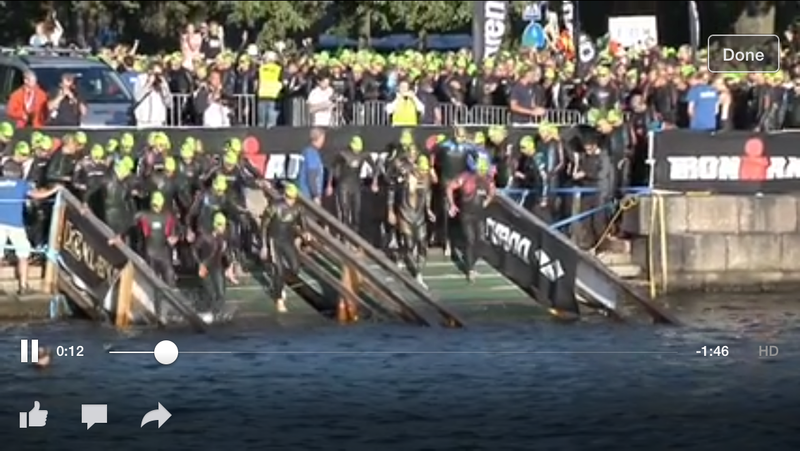 At 6:59 we get release to move to our starting line and 07:00 boom! It’s game time. I run down the ramp and dive in. Already on the first stroke I such in water. The first 10-12 strokes just feel wrong. I’m sucking down water, I can’t see to the right of me. 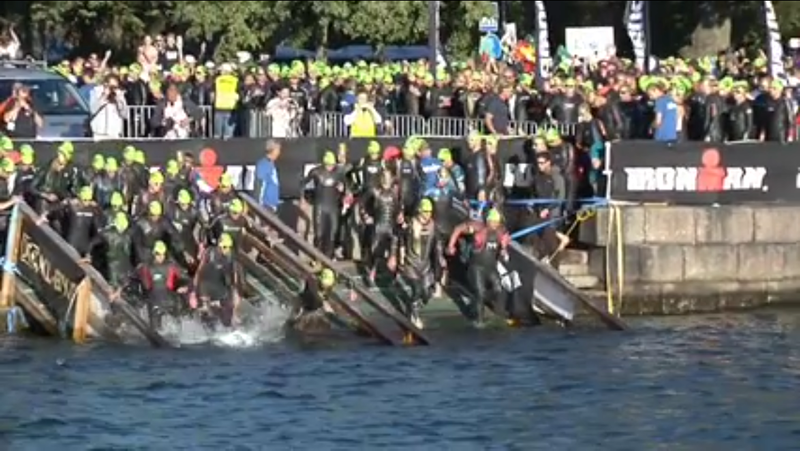 For the next 650-800 m it’s expect the unexpected swimming. Bodies going to the left and right of me. The waves are so tall I see nothing but a wall of water when I look forward. I swallow so much water that I throw up, but it was not bad as it was in Vidöstern 2012. I make the first turn. 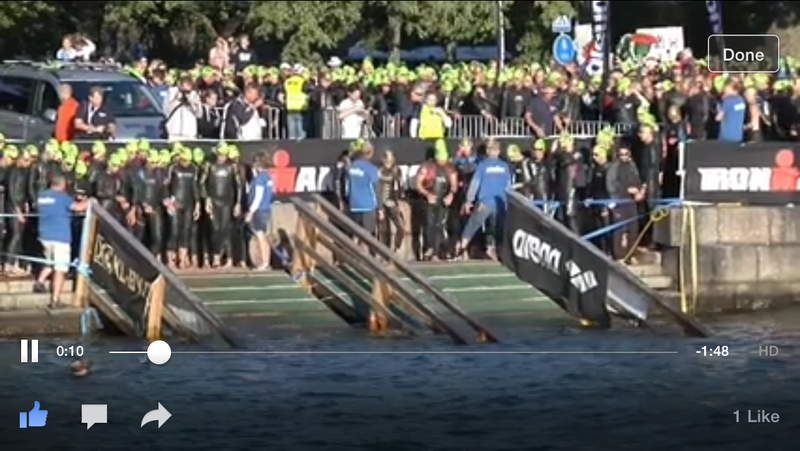 Things let up and I’m able to swim in peace, I hold to the left, but around all the buoys it gets tight again.. At the second turn, we turn into the current and I can relax for 100-150m. The fourth section is parallel to the second but so wavy but I was able to see the buildings in the back ground and I’m able to swim straighter. 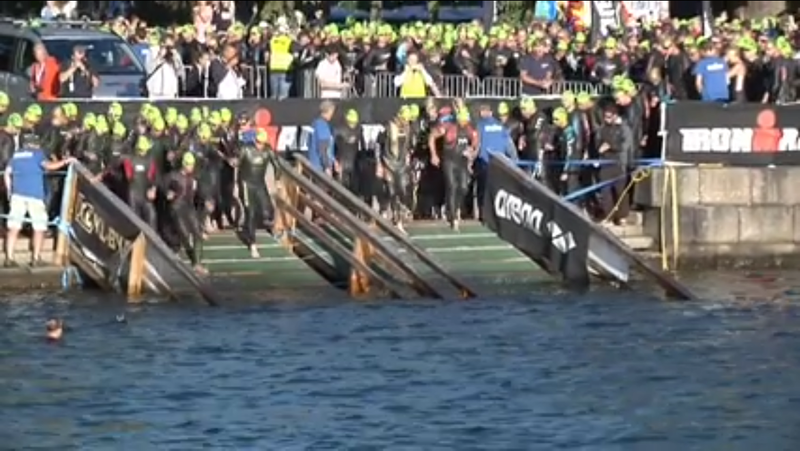 The first right turn on the course and again we can ride the waves back into the harbor behind the wave breaker wall. It was the most crowded swimming that I have ever experience in my life after nearly 3000 m swimming. We pass under a bridge and back out in front of the wall. The waves are pushing everyone into everyone and we started to get irritated with each other. I was 2s from putting one guy down! But I knew he wasn’t doing it on purpose. Finally, the last turn into the channel and crap I’m stuck in a huge group. I try to make my way to the left but it doesn’t help. Give up and decide to follow the group in.I wish someone had a video of my last 200m. I started to glide, and was taking 1 stroke for ever 2-3 of those around me. 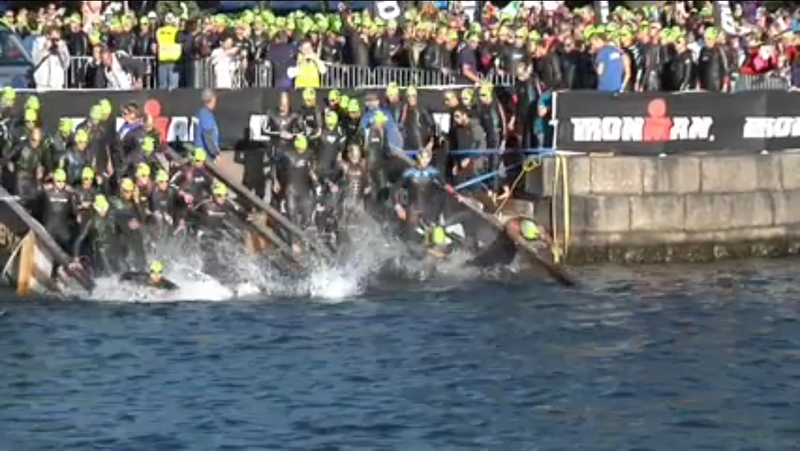 Out of the water at 1:02:47. Just over 7 minutes slower than last years swim. Considering that I am 16 kg heavier and have trained significantly less swimming the last 11 months I’m happy. 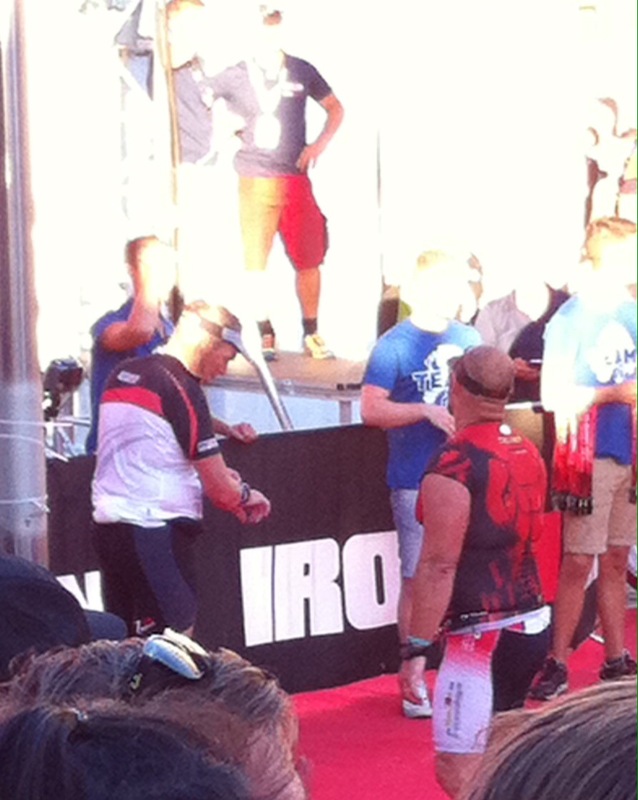 Walk into T1, grab my bike bag, put on my race number, bandana, helmet, shoes and glasses. I squeeze in a gel, pack my wetsuit and goggles back into the bike bag and head out to my bike. T1 took 3:40 slow but I was dizzy from the swimming. 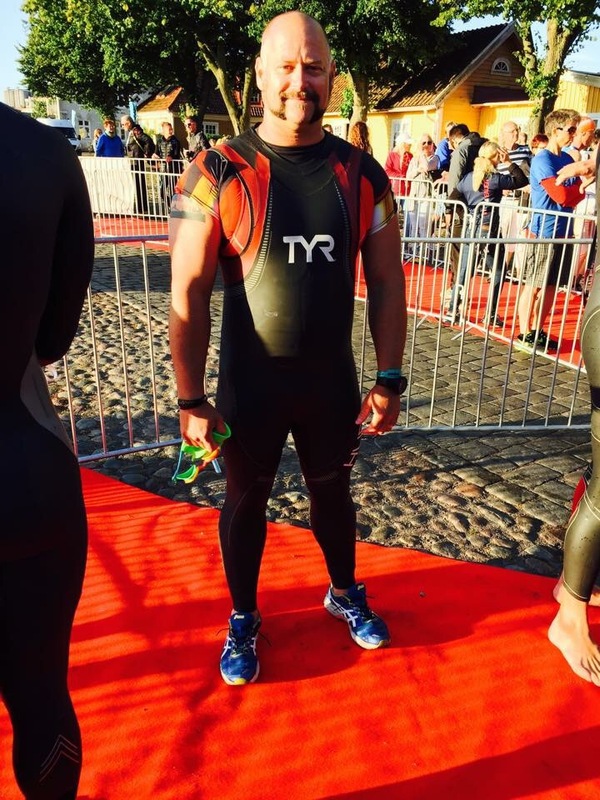 and this being my first triathlon race of the year i did not want to chance missing something going out to the bike. I think last year I was on by bike in less than 3 minutes. Out of T1 and on my bike and 180km ride, nearly twice as far as my only distance ride of this year. Last year I was out like a rocket. This year not so fast. I really took my time to slowly get my legs into it. The first 10-12km just over 25km/h. Gunnar and others are there at the first depot cheering me on. Over the next 137 km I find my legs and manage to maintain around 32km/h. Jonas and Steven were out of the course too, nice surprise to see them twice on Öland. 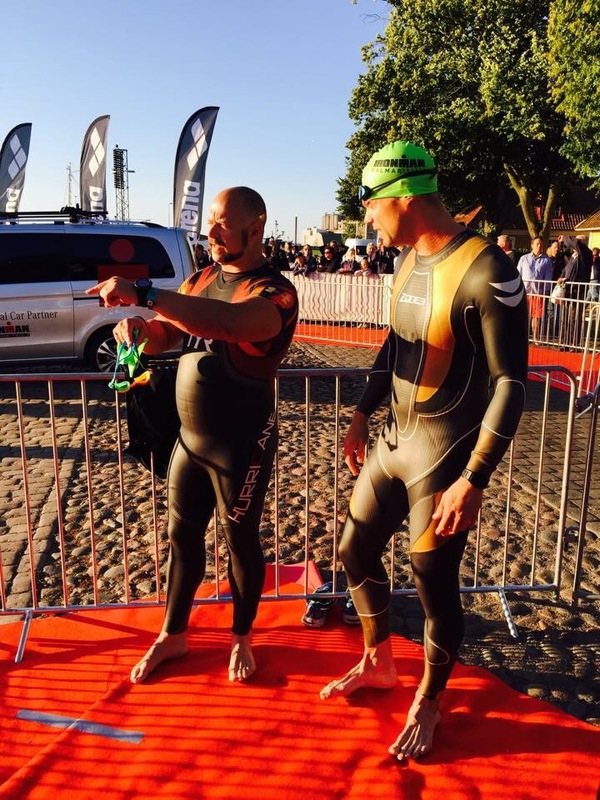 My slower swimming and easier start to the bike allow Jacob and Carl-Emil to pass me earlier this year. I take one pee pause at the same place as last year just around the 70 km mark. The final 30 km I slow down to just under 29 km/h, not because I’m tired or hurt, but the course is narrow and full of bikers. It seemed like I spent more time backing up to 10 m from the other riders than I did pushing forward. Off the bike after 5:48:19 (31.57 km/h) With only 5 biking workouts this year I was just hoping to go under 6 hours. But surprisingly, I was just 6 minutes slower this year than last year. Several people have complained about the wind during the race, but I only felt a head wind the first 10-13 km and again between 53-63 km. My current race time 6:54:46 also gave me 6 hours to go under 13 hours or 9 hrs to make the time cut. Deep inside I say, a five hour run would under 12 hours. Last years off bike race time was 6:39.44, just over 15 minutes slower than last year. 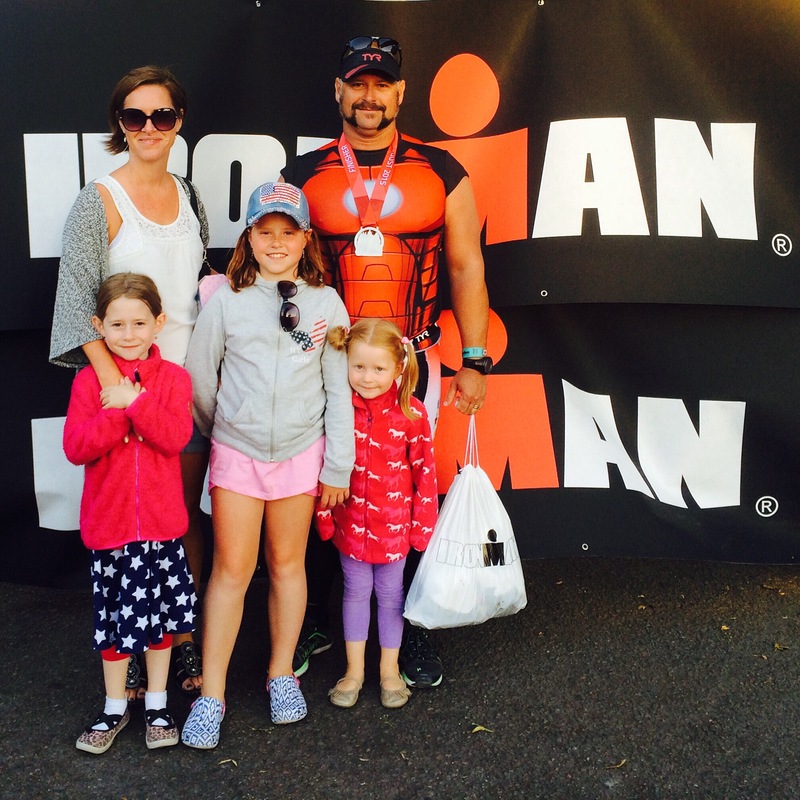 Amazing that with such little triathlon training, that I am doing this well, it puts a smile on my face. T2 takes 4:43, I walked in transition with my bike, I walked from my bike to the tent instead of jogging like I did last year, so that was 25 s slower than last year’s T2. Off for the last leg of the race, a marathon, 42.2 km. I truly tried to just jog over 6 min/km pace, but it was impossible. The crowd is screaming, the speaker’s voice in the back ground is motivating and the music is blaring around town. I finally slow down at the first depot. Drink some water and sports drink. I then manage to jog again to the second depot. at this point I try to slow down to over 7 min/km pace, but I can’t. So I go over to 30 s walk and 2 minute jog. I finish the first lap around 1:45. I met Jonas out around the 8 km mark and he was like, great pace Ryan, just keep it easy. The walking gets longer and the jogging shorter. I actually stop sweating. Second lap takes around 1:45 as well. Jonas sprayed water on my back to help me cool off. I’m talking longer and longer time at the depots. The final lap took just over two hours! But this year instead of getting bitter on the course, I waved to the crowd, I talked and cheered on my co-racers. I was in no shape to run a marathon. The extra 16 kg really did hurt the knees. 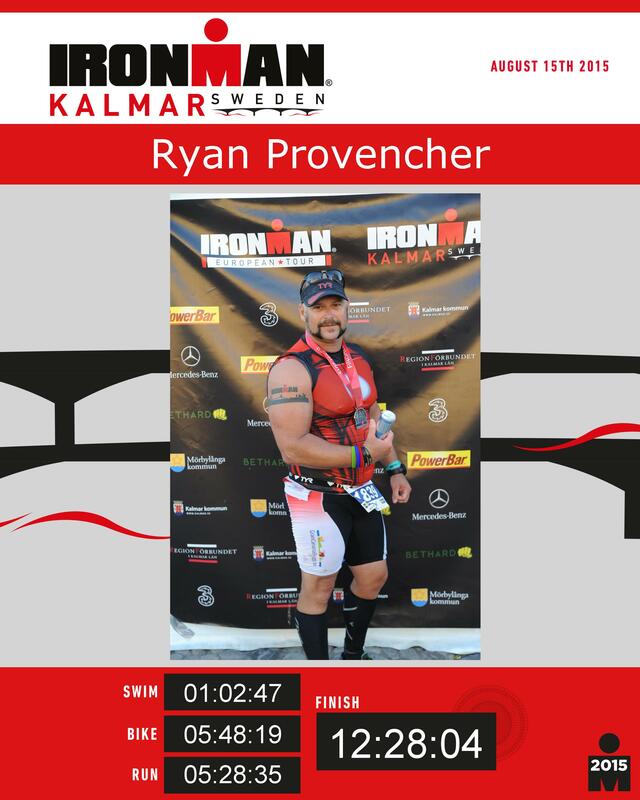 To make things interesting on the run, I had pulled down my tri-suit to show off my under armor Ironman shirt. Thanks to the shirt and maybe being the only Ryan on the course people seemed to remember me from the first, to second to third time I went around. Little kids wanted high fives from everyone but I got the impression a lot of them were really happy when I reached out my hand. 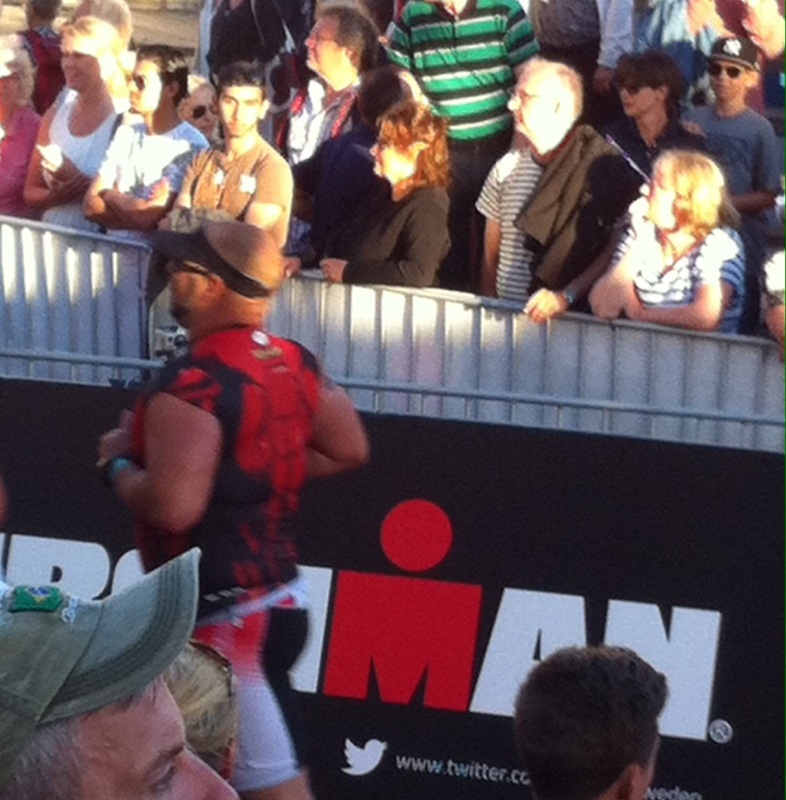 I heard comments from the crowd like “here comes a real ironman” and “ironman, more like terminator”. Some people who are not marvel fans said hey Spider-Man or Superman until they saw my back. 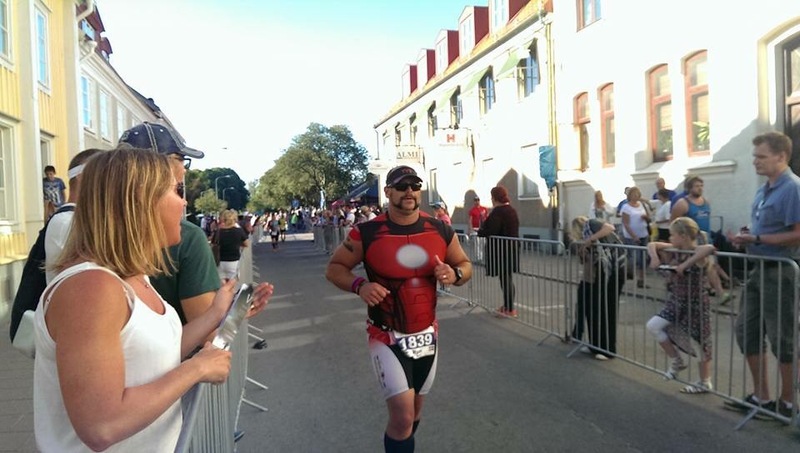 What really made my day on the second lap was when a competitor comments on by big biceps. And answered back, yeah but they are helping me right now with this marathon. 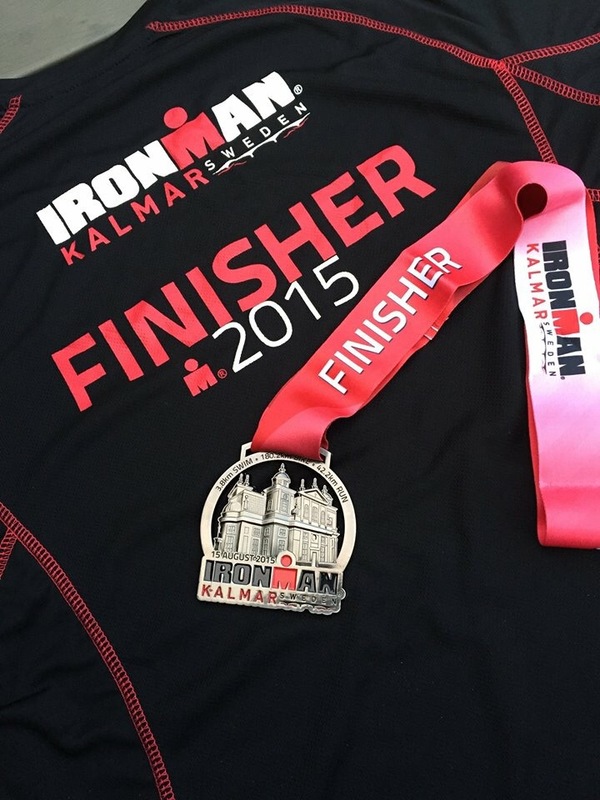 Thanks to everyone in Kalmar who cheered me on, to the volunteers that made the day possible and to those who followed my online one way or another! A special thanks to my mother-in-law for keeping my girls company the three days I was in Kalmar.